So you were enjoying life using Ubuntu and then one day you had to install Windows for that one application your boss makes you use and now no more Ubuntu. When we need a dual boot system it’s always best to install Windows first then Ubuntu due to Windows stripping out the boot loader but what if you have no choice? or a crash that corrupted the boot loader. Boot-repair to the rescue. run Ubuntu media in live mode. click “Recommended repair” and apply. 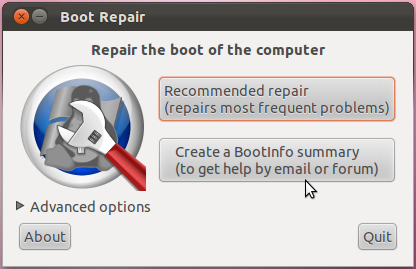 make sure you leave the “Reinstall GRUB” check-box ticked. Now reboot your system. now you can see GRUB back.